This blog contains Elana's musings about her struggle with infertility and her four miracle kiddos. Thanks for listening! This week's blog hop theme is "encouragement". People are posting their favorite quotes, spiritual passages, life lessons, sayings, photos and encouraging thoughts. I am going to post a photo along with my encouragement. This is a picture of my twins almost exactly a year ago. My encouragement is to all of the infertile couples who are reading my blog. Miracles do happen, and my twins are proof of that in so many ways. It can happen for you too! 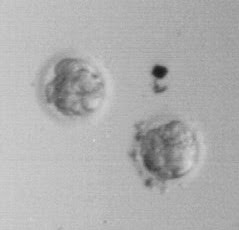 Even if they tell you that "one of your embryos doesn't have much hope, but we'll transfer it anyway", stay positive. My 5 cell grade C embryo is sitting next to me, sucking on her pacifier. There are still many souls up in heaven just waiting for their chance to come spend some time down here on earth. And if you're someone who has had a miscarriage (or several) or a stillbirth, know that these souls only had a very short time to spend, but they were sent down just for you. Miscarriages do serve a purpose, even if it doesn't seem like it. My sister, my husband, my twins (and possibly I) wouldn't be here right now if it weren't for miscarriages. Think about how many people walking this earth might not be alive today if their mother hadn't had a miscarriage (or several)...could even be you! This post is for the following women to have the zechus for zara chaya v'kayama: Rivka Tsivia bas Kayla Leah, Malka Avira bas Chaya T'sherniya, and Rizel bas Elka. May I hear very good news from all three women before the end of 2009, and may all the infertile couples in the world be able to share similar news as well. Great post!!! Yes there is hope. There ARE Good People in this World...Who Knew? This is the story of my life...and I write it everyday. Isn't TTC Supposed To Be Fun? To Vote or Not To Vote: What If You Are Not Allowed? We got hitched. We bought the 4 bedroom house. Now what??? Mar 14, 2013 ~ Ultrasound shows the baby to be a girl! Aug 30, 2013 ~ Gavriella Esther is born at 12:52pm. She weighed in at 6lbs 2oz & 19 in. Aug 6, 2010 ~ Ultrasound shows the baby to be a girl! Dec 30, 2010 ~ Tzipora Sara is born at 5:13am. She weighed in at 6lbs 7oz & 20 in. Aug 27, 2006 ~ Married! Oct 23, 2008 ~ Ultrasound shows Baby B to be a boy! Nov 18, 2008 ~ Ultrasound shows Baby A to be a girl! March 18, 2009 ~ Chana Brocha & Dovid Yitzchok are born at 7:28 & 7:29am! Chana weighed in at 5lbs 1oz & 17 3/8 in and Dovid weighed in at 5lbs 4oz & 18 1/4 in.